PHRASAL VERBS ATTACK AGAIN !! 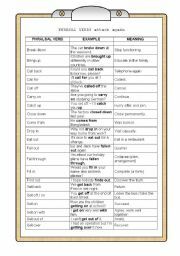 This is a thorough list of phrasal verbs for intermediate students. I hope you find it useful !! 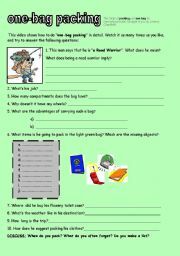 This worksheet is based on a four-minute video uploaded in youtube by Lindsay Clandfield, teacher trainer.Packing seems to be very hard for young people.Lindsay shows us how to make it easy. Will students like his way of packing? I�m sure the video will start some discussion. A three-slide set which deals with the second conditional and encourages students to learn a lot on the different items presented, fostering their curiosity and learning.I hope your students find it engaging !! Photos have always been a source of motivation for students.This is a creative activity which allows students to get involved in their own stories. Writing isn�t boring any more! !